Have you been at your home for a while and now your carpet has wrinkles in it? 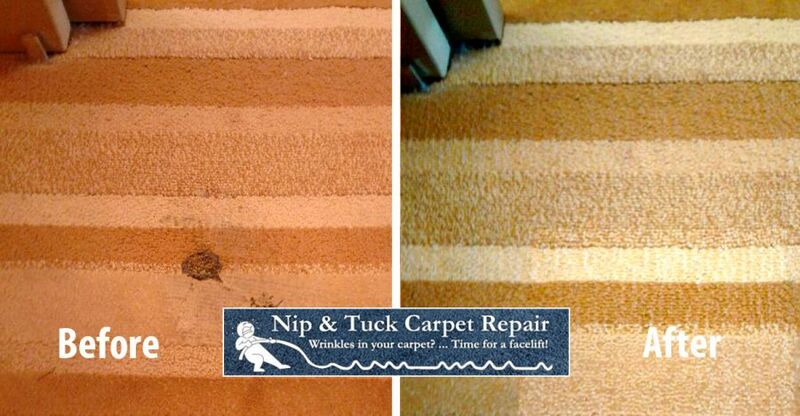 Call us at Nip & Tuck Carpet Repair for a free estimate because we can help you Denver. We use a power stretcher to ensure all our customers carpets are stretched adequately. Even with humidity and temperature changes, your carpet will still look good and flat. Our Carpet Stretching comes with a 5-Year Guarantee. We are that confident in our work. Let us give you a reason to trust us, your carpet repair company. Our warranty states that for the duration of 5 years after completion of repair work or installation, Nip & Tuck Carpet Repair LLC guarantees their workmanship. Issues covered under this warranty include wrinkles that form after being restretched, fraying seams, and carpet that is unsecured onto tackstrip. Stipulations that would void this warranty would be excessive moisture (flooded for several days), pet damage, or carpet defect. This warranty does not cover whatsoever the quality of the carpet such as wear resilience, stainability, etc. A certificate will be left with qualified customers after completion of the carpet repair work or installation. This is a patched iron burn from a local hotel here in Denver. The results were great! The after looks great and the hotel room carpet looks as good as new. Whether commercial carpet or residency, we have the knowledge and expertise for all of your carpet repair needs here in Denver. Pricing can vary on carpet repair work depending on factors such as yarn style (berber, frieze, plush, etc. ), size of repair, available remnant pieces, etc. Therefore, we are not able to give exact pricing online, but we can give you an over-the-phone estimate, in-home estimate, or an estimate via email. Give us a call for a free estimate today! Where Does the Carpet For a Patch Come From? Can You Stretch with Furniture in the Room? If the Carpet is Patched, is it Very Visible? I Should Clean My Carpet Before the Stretch….Right? Specializing in Carpet Stretching and Repair in Denver, Colorado.